This blog will share with you 11 of the most essential areas you should consider when setting up a children’s nursery setting. It will help guide you through some of the most important priorities and help you focus on getting the basics right. By following these steps it will eliminate a lot of pain further down the line. The building that you choose when setting up a children’s nursery is a major factor. Without it you do not have a nursery to operate from. Therefore making sure it is fit for purpose and meets all of the planning and building regulations necessary is so important. The range of priorities to consider include whether planning permission is required right through to the finer details of ensuring that children’s toilets and sanitation equipment is installed. Questions such as will this building enable us to cook fresh food from the kitchen facilities in a safe and hygienic environment on a daily basis? should always be asked when viewing a building. If answers to such questions are no then renovation work may be required. You really will need to visualise the building from a practical, social, childcare and health and safety point of view. For example will the space enable the children to be safe in designated areas such as a baby room and is there room to play safely so activities can be observed properly and enjoyed by the children? Having a list with you of great questions like this will help you in making an informed decision about the building to choose. Having a budget, researching and understanding all of the up front and ongoing costs associated with setting up a children’s nursery will be essential. Doing some homework and investigating for example what start up grants are available is a good place to begin. Be prepared to have to put some of your own cash into the venture too or perhaps asking for help from family and friends to get the venture off the ground. Other alternatives such as peer to peer lending could also be an option. Ultimately this is about you doing your due diligence and coming up with a financial plan that is comfortable for you and your financial circumstances. This might be highlighting the obvious to you but it should be of no surprise that setting up a children’s nursery will be time consuming. You have to accept that starting out in any new enterprise requires hard work and dedication but the fact you are reading this article and have a passion for this will overcome such challenges. Just be prepared to allocate a considerable amount of your time to your venture and factor this into how it may impact your own personal time with family and friends. Having a good time management system in place will help with this. Outdoor learning is a great way to engage with children and for them to enjoy the beauty and fun of the outside World. It opens up our senses and provides a wonderful environment of wellbeing and fun. Thinking about what natural resources are available at your nursery will be integral to a child’s learning journey. Consider the outdoor space you will provide and the equipment and activities that will be available for the children. It will not only support a child’s development but will add huge value to your facilities that parents will appreciate when considering placing their children with you. Insurance may not be the most exciting priority you will need to have in place and can often be forgotten about until the last minute but it is really important to get a good policy in place ready for when you open your doors. The bare minimum to ensure you have in place is a policy that has a good Public and Employers Liability section. The other vital area of protection you will need to have in place is cover for property damage in the event of a fire, flood or theft for example and protection against loss of revenue should the unfortunate happen and you have to close your nursery for a period of time. There are a plethora of additional insurance products available that you may also wish to consider such as Legal cover. It is advised that you speak with an insurance specialist when selecting the insurance cover that is right for you and your nursery. No matter what business you are in the beating heart that keeps it going is how it is marketed. Without children being placed in your setting you won’t have a viable business. The one question to keep asking yourself is, how will parents find out about my nursery? When you are setting up a children’s nursery being online is essential these days so a priority must be to have a website which parents can refer to and learn about your nursery from. Other marketing activities such as advertising in your local community and holding open days can be great ways to get your presence known. Never become complacent about marketing. It should be a core activity that you focus on constantly. You want to be turning children away because your nursery is in demand not having to slash your prices to make up your places. Paperwork and getting your house in order is of critical importance when setting up a children’s nursery. Ofsted will not be impressed if you don’t keep records such as employee documents and policies and procedures compliant and up to date. Set up a paperwork system that allows you track all of your documentation you need to keep in your nursery and make sure it is in an easy to use filing system so you can locate a document when you need it. Finally make sure it is secure whether you store your documents online or in paper format. Keep them safe and protect the data you are storing. This section will link in nicely with your marketing strategy. Many nurseries are now choosing to specialise in a certain area to encourage and support learning. It also increases the chances of parents taking note of your nursery and ultimately choosing to place their children with you. You could consider specialising in outdoor activities, which would relate back to section 4 of this blog. Or you may have a talent or love of music that you would like to focus on as a core theme in your nursery. This is a great way to energise learning and generate engagement amongst children. The opportunities are endless! Ofsted is the Office for Standards in Education, Children’s Services and Skills. They inspect and regulate services that care for children and young people. You must be registered with them and meet their standards in order to operate a children’s nursery. This might be highlighting the obvious but it doesn’t hurt to do your research up front and get as much detail as you can about Ofsted and how they assess the performance of nurseries. Check against the Ofsted Common Inspection Framework, which sets out how Ofsted inspects registered early years settings in England. Ensure you are complying with their key priorities. You are about to embark on a journey in a very regulated sector, so be obsessive about the detail and learn everything you can about Ofsted and their framework. By doing this there will be no nasty surprises further down the line and you will be fully prepared for all Ofsted inspections. When employing people in your setting you must be paranoid about their qualifications and ability to perform the roles you are employing them to do. Are they properly qualified? This is really important and is a link back to point number 9 about complying with Ofsted. 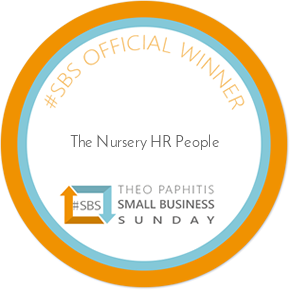 At the very start of your new venture it should be about having a great induction with your staff, where you introduce them to their workplace, team and share with them what your vision is for the nursery. From a vocational point of view it will be about your employees either having or working towards their required level 3 childcare qualification. Continual Professional Development should also be at the centre of what you do and CPD courses are often short courses designed to enable learning which is based on the work environment and childcare. A CPD record should be kept by each employee so they can track their progress and review their achievements. Some areas of CPD training will be mandatory such as Food Hygiene, Paediatric First Aid and Health and Safety. Finally this tip really should weave through everything you do when it comes to setting up a children’s nursery and the running of it. You must be organised. You will be wearing many hats as you go through this journey and you will often feel you are being pulled in a variety of directions at the same time. But by being organised and having a clear plan of the steps you are working through on a daily, weekly, monthly and yearly basis it will support you in keeping in control of the challenges and demands you will encounter. The biggest piece of advice that has served me well over the years is always planning my next day ahead. By doing this single activity you will have absolute clarity on what your key priorities are that you should be working towards each and every day. I wish you well in your new venture and remember to have fun and enjoy the experience along the way. You are embarking on an exciting adventure that will provide so much joy to the children you will be caring for and make a vital contribution to their development and wellbeing. I hope you have received real value and helpful advice from reading this blog. 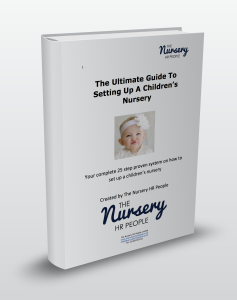 Don’t foget to get the full 25 step blueprint on what is involved when setting up a children’s nursery by clicking on this link https://www.thenurseryhrpeople.co.uk/the-ultimate-guide-to-setting-up-a-childrens-nursery/. Please feel free to drop me a line at donna@thenurseryhrpeople.co.uk with any feedback you might have. Wishing you every success for the future.